RANGOON — Dr. Maung Aung has the ambition to ease a shared source of suffering for Rangoon residents since 2011—traffic congestion—by the end of the year, implementing a series of changes from a computerized traffic control system to a drastically streamlined bus network. Dr. Maung Aung is the secretary of the Yangon Region Transport Authority (YRTA), formed by the new government installed in April to modernize the transport sector in Burma’s rapidly growing commercial capital of 5.2 million people, which has boomed since the launch of political and economic reforms in 2011. The YRTA is headed by Rangoon Division’s Chief Minister U Phyo Min Thein, and includes other government ministers alongside technical experts. Dr. Maung Aung, who is also a senior economist, is not new to Rangoon’s transport scene. 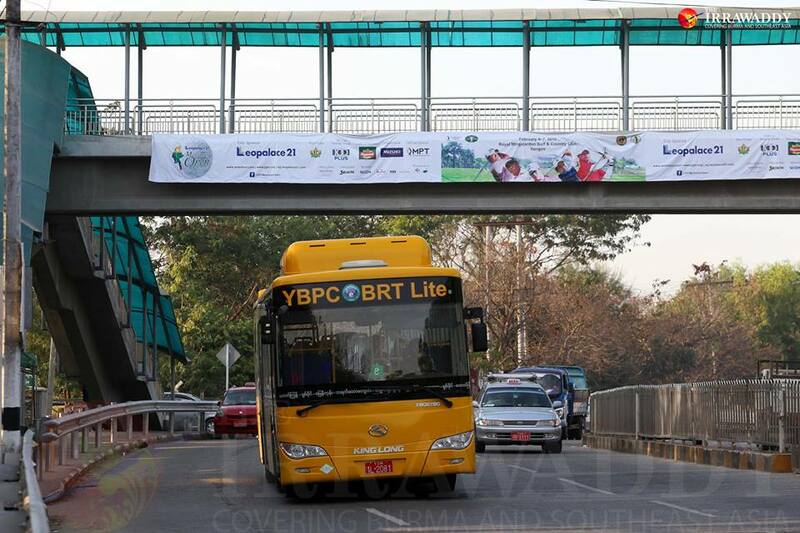 He chairs the Yangon Bus Public Company, which in February this year launched Burma’s first Bus Rapid Transit (BRT) system in partnership with the government, now operating on a limited number of lines in central Rangoon. Against an existing bus network notorious for poor maintenance standards and a weak adherence to traffic rules, the publicly lauded BRT system offers sleek new buses equipped with air conditioning that are less prone to crowding and generally cost passengers only slightly more than other bus lines. The YRTA secretary said that, through an improved bus network and a new computerized traffic control system, he expected they could ease current traffic congestion by 40 percent. For the new government, traffic sits alongside a roster of other Rangoon problems: power blackouts, inadequate drainage, a shortage of affordable housing and a related growth in squatter settlements. 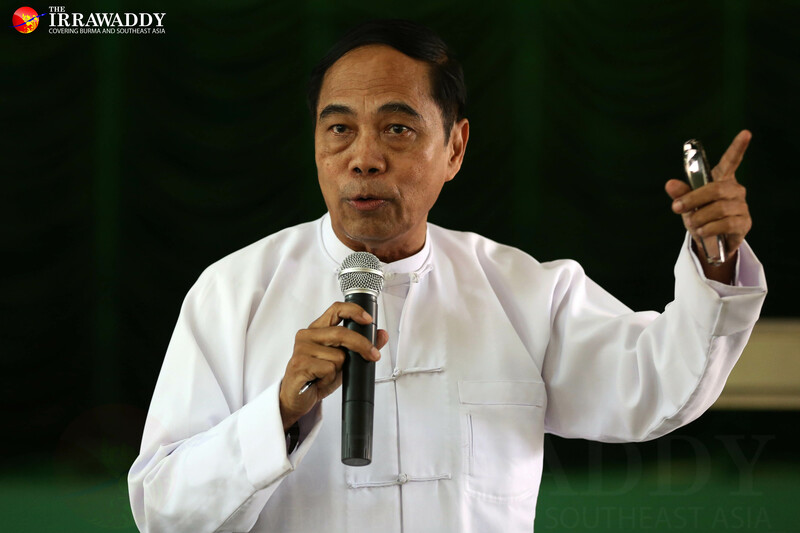 Rangoon Chief Minister U Phyo Min Thein vowed soon after assuming office in April to alleviate the traffic situation for millions of frustrated commuters. The former government made similar pledges, but—besides the introduction of the BRT system in February—largely focused its efforts on the construction of seven flyover bridges at the cost of 130 billion kyats (more than US$100 million). The flyovers were criticized for being ineffective—simply displacing congestion from major junctions to other stretches of road—and for offering poor value for money. The new Rangoon Division parliament in April cancelled the previous administration’s plans to build two new flyovers in Rangoon. After the government lifted car import restrictions in Oct. 2011, the number of vehicles plying Rangoon’s previously sleepy streets rocketed year-on-year—from 214,000 in Aug. 2011 to more than 500,000 by Oct. 2015, according to figures from the Rangoon Division government—prompting concerns that Rangoon may follow the way of Bangkok, Jakarta and Manila, cities notorious for their unwieldy traffic. Before 2011, traffic standstills were rare, only taking place in the cases of accidents or malfunctioning traffic lights. The city center could be reached from the rural fringes in less than an hour at any time of day. U Yan Aung Min, a member of the Rangoon Division parliament representing Shwepyithar Township in the northwest of Rangoon, said he leaves his house every morning at 6 a.m., taking about two hours to reach parliament—a journey that took 45 minutes back in 2010. Beyond burgeoning car ownership, the failure to enforce traffic rules and an inefficient bus network are other factors behind the gridlock. An estimated 2.6 million people rely on buses for their daily travel to and from work in Rangoon, making up 70 percent of all the city’s commuters. Meanwhile, trains on the city’s antiquated Circle Line ferry around 100,000 daily, according to 2014 data. Despite upgrades in recent years, including air-conditioned carriages, it offers travel to only a limited number of destinations, burdening bus lines with most commuter journeys. Ko Myat Min Thu, a member of the Rangoon Division parliament representing Hlaing Tharyar Township on the city’s northwestern outskirts, claimed he spends five hours a day on buses. 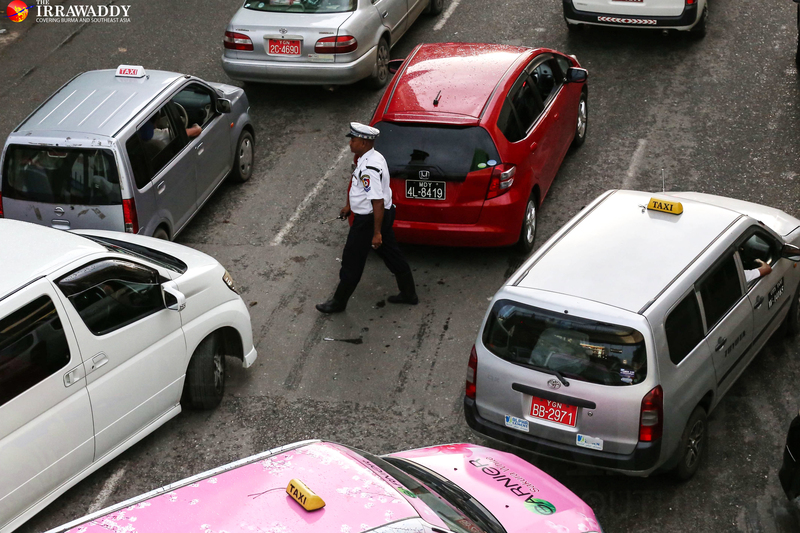 Daw Sandar Min, another lawmaker in the Rangoon parliament, blamed worsening traffic jams on a lack of proper parking places and ill-disciplined parking practices, with cars parked two or three abreast on some roads, clogging the passage of vehicles. She also cited some “60,000” taxis now plying the streets, another phenomenon of recent years. There is also the heavy fragmentation of Rangoon’s bus network, in which vehicles are operated by hundreds of small private companies, competing to cram passengers onto old Japanese Hino Motors buses, among other outdated models, with no air conditioning and uncomfortable seating. According to the Yangon Division Motor Vehicles Supervisory Committee, popularly known by the Burmese-language acronym Ma Hta Tha, over 7,800 buses are registered in Rangoon, of which between 4,500 and 4,800 run on any given day. Buses owned by individuals and small companies are rented out to teams of drivers and conductors, whose income purely depends on the number of passengers. This induces them to race dangerously with other buses to compete for passengers, overload vehicles, and make unscheduled stops—including stops of several minutes till a desired number of passengers alight. U Hla Aung, chairman of Ma Hta Tha, said half of around 200 complaints received per month on average relate to conductors overcharging passengers. Other complaints included dangerous driving and buses arbitrarily changing their routes. According to Rangoon Division’s No.2 Traffic Unit, 953 road accidents over the first four months of 2016 killed 233 people and injured 1,293. Of the accidents, 484 were attributed to reckless driving. Since last year, traffic police have been accepting reports of traffic violations via the Viber smartphone app, but inadequate staffing and the absence of a comprehensive monitoring system have prevented action being taken in most cases. 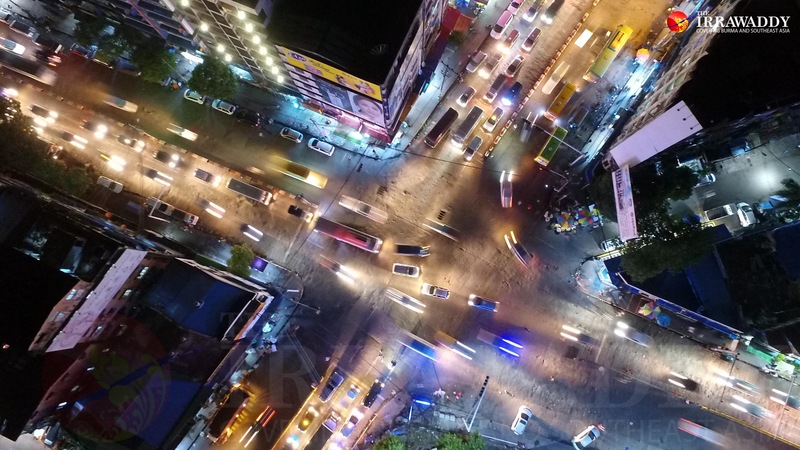 YRTA secretary Dr. Maung Aung said that construction of a computerized traffic light system for the city, with a centralized command center, would be completed next month, three months behind schedule. Once up and running, he said that swift action could be taken against those breaking traffic rules, thanks to a comprehensive surveillance system. Traffic light signals could also be modulated based on the relative number of vehicles passing through different parts of the city. Besides traffic lights, the YRTA is upgrading and streamlining the bus network, alongside upgrades to the Circle train line. It is also considering the introduction of new water taxis on Rangoon’s rivers. “If we have better public transport services […] private vehicle owners will use it and traffic congestion will improve,” Dr. Maung Aung said. Under the YRTA’s plans, the bus lines currently owned by individuals and small companies will be merged into a handful of public companies, which can be more easily regulated and coordinated. “Buses under the new system will ensure the safety and comfort of commuters,” Dr. Maung Aung said. Similar to the current BRT system, new buses will use a standardized pre-purchase ticketing system, conductors will be abolished, drivers will be paid set monthly salaries, and older vehicles will be banned from key routes. Buses operating in the outer neighborhoods will not be allowed to travel to the city center; shuttle buses will connect them with the central bus network. Dr. Maung Aung said the YRTA would work to alleviate any negative short-term impact on drivers, and would provide them with training in the coming months. He also suggested that the government would meet 50 percent of the funds required to establish the new bus companies. So far, applications to form 21 such companies have been received. Dr. Maung Aung said attempts to improve the transport system under the previous government largely failed due to weak collaboration between ministries. He said that the YRTA enjoys stronger support from than current government than the previous government gave to its own initiatives. The YRTA has the additional advantage of only having to work with one ministry. “We have strong political will now. With the new elected civilian government, we will try to satisfy the public’s longing for better public transport,” he said.